Yesterday the Herne Hill Velodrome, the oldest surviving venue of the 1948 Olympic Games, opened a series of improvements funded by Southwark's Olympic Legacy Programme. These include new floodlights, a junior track, and a multi-use games area within the newly-resurfaced track centre. 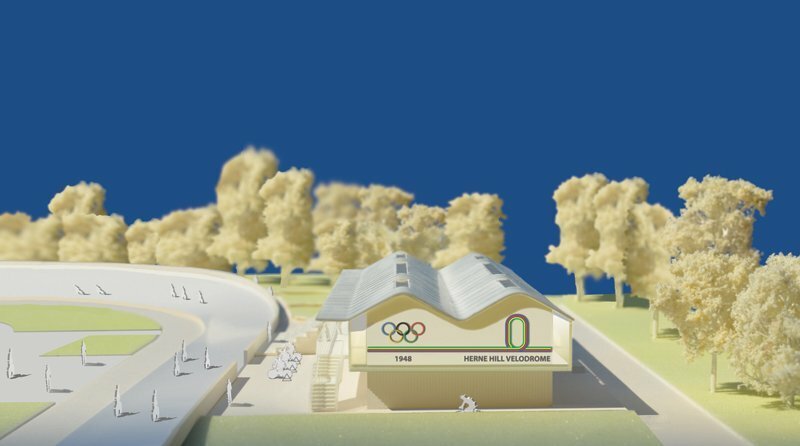 On the same day The Herne Hill Velodrome Trust launched its fund raising programme for the new Pavilion also designed by Hopkins Architects. The new £3 million building will house changing rooms, bike storage, special gym and fitness rooms and a cafe. The Herne Hill Velodrome Trust, the charity entrusted with saving the important site, has partnered with a number of high-profile supporters on the project including LOCOG chairman Sebastian Coe, former Olympics Minister Tessa Jowell, British Cycling President Brian Cookson, Sir Dave Brailsford, Lee Dixon and Victoria Pendleton.